We are looking for Researchers/Senior Researchers who will work closely as part of the Editor-in-Chief's team, as well as with the news desk to provide research for news shows on the channel. We are looking (or candidates who have strong analytical skills, interested in going deep into issues that emerge as part of news coverage and have the proven ability to meet deadlines. Graduates/Post graduates, with experience in news media - print/television/web may apply. For the above positions, we are looking at go-getters with an incredible passion for news, excellent television skills and the proven ability in rewriting/writing news copy. The candidates will be put through a fast learning curve to learn to handle all key newsdesk operations in India's number one television news channel. They will be involved in every aspect from rewriting copy, making rundowns, packaging news stones and taking editorial decisions. Candidates with previous experience in output desk/copy desk in an English news channel, as well as reporting/copy desk in news media are encouraged to apply. For the input/assignment desk at Times Now, we are looking for those who have an eye for news, can sift out the big stories from the news pouring in, have the skills to filter through inputs from agencies/bureaus and ensure that the channel stays on top. Candidates with a good educational background, with 3+ years of experience, preferably in a similar rote in national/regional TV news channels are encouraged to apply. You will need to show proven ability to meet deadlines and the skills to handle communication with bureaus /stringers of Times Now in India and abroad. 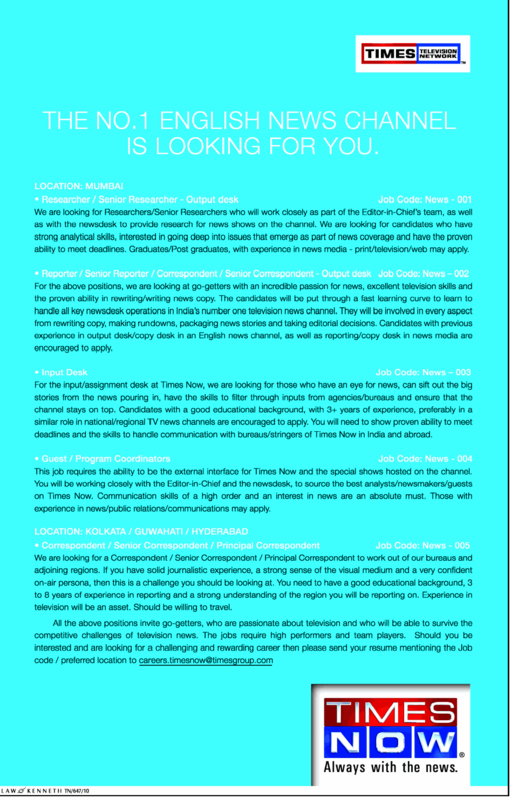 This job requires the ability to be the external interface for Times Now and the special shows hosted on the channel. You will be working closely with the Editor-in-Chief and the newsdesk, to source the best analysts/ newsmakers/guests on Times Now. Communication skills of a high order and an interest in news are an absolute must. Those with experience in news/public relations/communications may apply. We are looking for a Correspondent / Senior Correspondent / Principal Correspondent to work out of our bureaus and adjoining regions. If you have solid journalistic experience, a strong sense of the visual medium and a very confident on-air persona, then this is a challenge you should be looking at. You need to have a good educational background, 3 to 8 years of experience in reporting and a strong understanding of the region you will be reporting on. Experience in television will be an asset. Should be willing to travel.